byLuke Chung, President of FMS, Inc.
Tabs are a powerful and easy to place and use on Microsoft Access forms. A tab control contains pages (tabs) with each page identified by its PageIndex property starting with 0. The value determines the order of the tabs. While using the tab's value works, it's not the best over time. If the tabs are reordered (for instance page 0 and 1 are swapped), the values no longer reference the original pages and your code will crash or not work properly. Similarly, if you add/insert or delete tabs, the values no longer reference the pages as expected. With this approach, as long as you don't rename the pages, no matter which order the page is on the tab control, it's properly referenced, and the code you have specifically for that page always works. When you click on the tab pages, the tab control's Change event fires and a message box shows the caption of the selected tab. 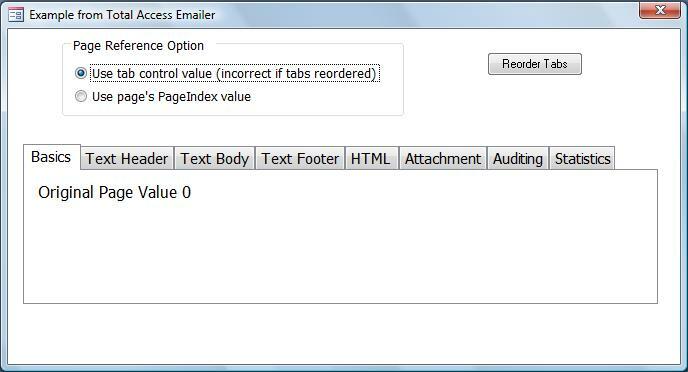 By changing the Page Reference Option, the message box that is presented is based on using the tab control's value or the PageIndex. The first fails if the tab pages are reordered. The second option always works. You can see this when you press the [Reorder Tabs] button which randomly makes one of the tab pages the first one. A more realistic use would be page specific code such as setting up the controls on the page when it is selected the first time but that would complicate the focus of this example. Check out this resource for Late Binding Subforms on Form Tabs. That example references the page name rather than the index which is another way to do this.